Today I released a new free tool for ConfigMgr administrators and support staff. ConfigMgr Remote Compliance can be used to view, evaluate and report on System Center Configuration Manager Compliance Baselines on a remote computer. It provides similar functionality to the Configurations tab of the Configuration Manager Control Panel, but for remote computers. 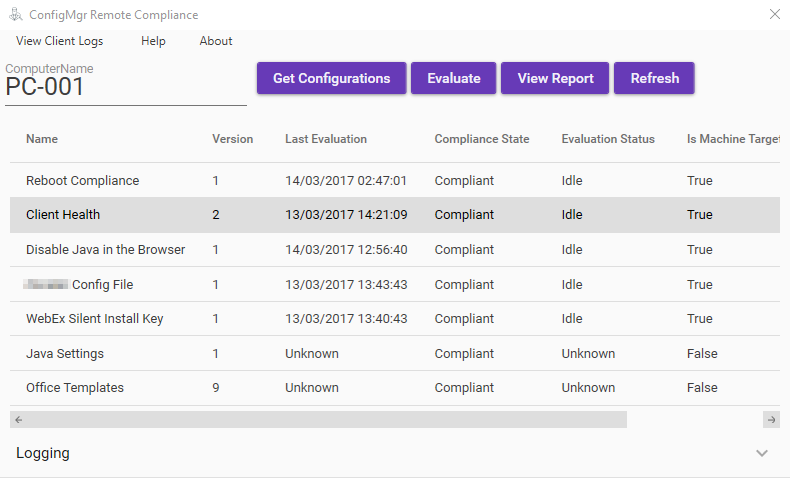 It is a useful troubleshooting tool for remotely viewing client compliance, evaluating baselines, viewing the evaluation report or opening DCM log files from the client, without needing to access the client computer directly. ConfigMgr Remote Compliance can be downloaded from here. Source code for this application is available on GitHub and code contributions are welcome. Some time ago a wrote a blog describing a way to deploy custom templates for Microsoft Office applications using SCCM Compliance Settings. Since then, I have re-written the solution into something much more manageable as the previous incarnation was not very clearly defined in how to update templates, and involved some considerable admin overhead. This updated solution is much improved and better manages the lifecycle of your custom templates, including updating, adding and retiring templates. Much of this process is now automated using PowerShell, and I have removed the need to manually specify all the template file names in the scripts so it is also much easier to set up and deploy.